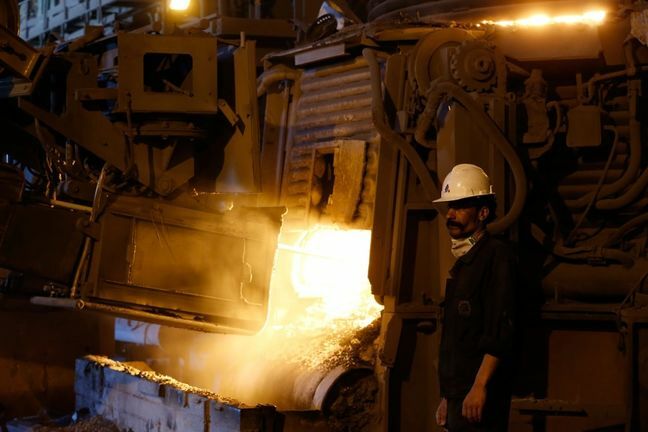 EghtesadOnline: Iranian steel mills produced 8.12 million tons of crude steel during the first four months of 2018, up 27.6% compared with last year’s similar period, according to the latest report released by the World Steel Association. The country's steel output in April grew by 12.4% year-on-year to hit 1.95 million tons. Iran is currently the world’s 11th biggest producer of steel. The country is placed between Italy (10th) with 8.48 million tons and Mexico (12th) with 6.99 million tons. The world’s 64 steelmakers produced 575.155 million tons of steel during the four months, up 4% YOY, Financial Tribune reported. Global steel output stood at 148.32 million tons in April, indicating a 4.1% increase YOY. China was the world’s largest producer during the four-month period with 288.96 million tons of steel output, up 5% YOY. Chinese steel production hit 76.69 million tons in April to rise 4.8% YOY. China was followed by India with 35.38 million tons, Japan with 35.12 million tons, the United States with 27.74 million tons, Russia with 23.79 million tons, South Korea with 23.69 million tons, Germany with 14.78 million tons, Turkey with 12.49 million tons and Brazil with 11.59 million tons. Crude steel is defined as steel in its first solid (or usable) form: ingots, semi-finished products (billets, blooms and slabs). This is not to be confused with liquid steel, which is steel poured. Iran’s steel output stood at 21.72 million tons in 2017, according to Worldsteel, up 21.4% YOY. The country aims to become the world’s sixth largest steel producer as per the 20-Year Vision Plan, which targets an annual production capacity of 55 million tons of steel and 20-25 million tons of exports per year by 2025. Iranian steel mills have so far realized more than 30 million tons of the capacity target. Latest statistics by Iranian Mines and Mining Industries Development and Renovation Organization show that the country produced a total of 10.58 million tons of finished steel products, including hot- and cold-rolled coils, rebar, beams, pipes, wide and galvanized sheets, in the last fiscal year (March 21, 2017-18), up 5% YOY. Global direct-reduced iron output increased 14.86% year-on-year in April, according to Worldsteel. Total output was 7.11 million tons in April compared with 6.19 million tons a year before, an increase of 920,000 tons. Production was also up on a monthly basis, with April figures 140,000 tons higher than the 6.97 million tons produced in March 2018. The largest increase was in Iran where yearly output increased 670,000 tons or 42.68% YOY. This additional material accounts for 72.83% of the global YOY increase. The country has been working to increase its iron ore processing capacity, including both DRI and hot-briquetted iron production, while it targets raising its total steel output to 55 million tons per year by 2025, up from 17.9 million tons per year in 2016 to feed its steelmaking expansion.